The town of Koper was built on an island which was linked to the mainland in the 19th century by embankments. By draining the swamp area between the island and the mainland, the town acquired an extensive plain which has developed into a commer­cial and industrial center. In Roman times Koper was called Goat’s Island; Insula Caprea. In the Mid­dle Ages it was the first among the towns of Istria to receive self-administrative rights. 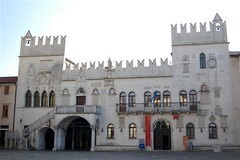 From the 13th century onward Koper was under Venetian administration and was a very influen­tial town at the time. In this period five mayors of Koper sat on the throne of the Venetian doges. From 1879 onward Koper was under Austrian rule. This Mediterranean town was fortified with mighty walls. Of the 12 doors which led to the town, the main door is still preserved. Among the bourgeois houses and palaces there were also some monasteries. Modern ur­ban development begun after World War II completely changed the image of Koper. Numerous buildings from the 15th to the 18 centuries are still preserved and today give the town a majestic appearance. Some of the more important preserved buildings are: Praetor’s Palace dating from the 15th century, a Gothic-Renaissance cathedral with a rich ba­roque interior from the 15th and 16th centuries, the Carpaccio House, the Tocco palace which today houses the Ethnographic Museum and its archaeological collection, the Garvivi Castle. 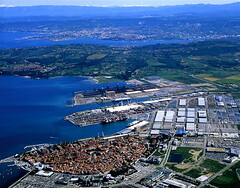 Today Koper is the only Slovene port with cargo terminals. The Koper Hotel is located by the sea in the centre of the Mediterranean town of Koper. The hotel is ideal for all those seeking to get to know the town of Koper and the Slovenian coast. The mild Mediterranean climate and the abundance of sports facilities in the town enable a pleasant active holiday as well as the organisation of friendly or professional sporting activities all year round. The hotel is also a good starting point for exploration of the sights on the coast and in the nearby Karst region, such as Lipica, Postojna and Skocjan Caves. The Aquapark Hotel Žusterna with its varied offer invites guests all year round to sunny Koper near the Adriatic sea. Covering more than 1,200 m2, the Aquapark offers unique outdoor and indoor water attractions: slides, a wave pool, children’s pools with play equipment, a pool with underwater massage, whirlpools, etc. The adjacent Justinopolis Wellness Center has a diverse offer for a healthy and pleasant stay.